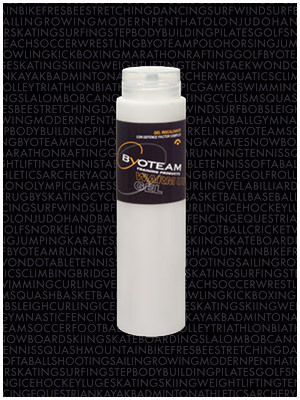 A light, fluid gel for warming up muscles and ligaments before physical exercise. If applied after sports activities, it is quickly absorbed by the epidermis and provides mild anti-inflammatory action and quick relief for the treated areas. A mild sensation of warmth that spreads with time is proof that the product is working. Apply abundantly to the area to be treated and massage until completely absorbed. Aloe Vera, Devil's Claw, DFC (Vitamin A, Vitamin E, Olive oil, Almond oil, Jojoba oil, Iron, Copper, Zinc, Magnesium).